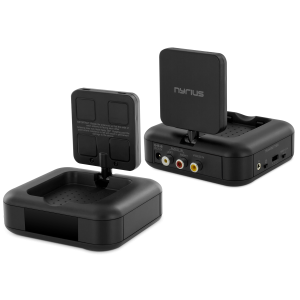 Wireless Analog Video Discover the freedom of wireless home entertainment with our wireless video transmitter & receiver system. Broadcast RCA video wirelessly and neatly organize all your audio/video sources by keeping them out of sight in another room or cabinet without installing lengthy cables throughout your home or office. 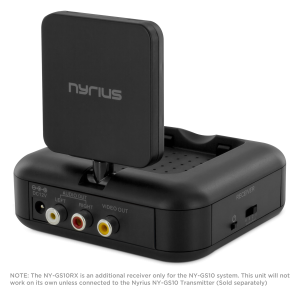 Wireless audio/video transmission allows you to broadcast the signal from your analog RCA enabled source to your TV or projector. This means you can watch TV upstairs from your cable box installed in your basement, without needing to run wires or purchase additional cable boxes. Broadcasting to multiple TVs? With wireless video transmission you can broadcast a single source of media to multiple TV sets simultaneously using one transmitter and additional receivers. Setup is fast and easy. Simply connect the included RCA cables from your source to the transmitter and connect the receiver to your TV with RCA. Wireless connectivity made simple.